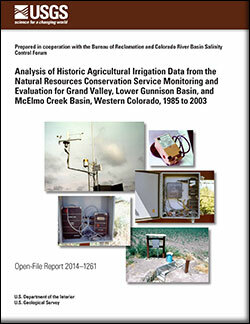 The Natural Resources Conservation Service Monitoring and Evaluation for three salinity control units in western Colorado—Grand Valley, Lower Gunnison, and McElmo Creek—from 1985 to 2003 was a response to the Colorado River Basin Salinity Control Act, Public Law 93–320, July 24, 1974, and its amendments. The Natural Resources Conservation Service evaluated the effects on seasonal irrigation efficiency and deep percolation of irrigation water of various on-farm irrigation system improvements in the three salinity control units, and reported the results in a series of internal Natural Resources Conservation Service annual reports. Because of the large amount of effort and expense that went into the Natural Resources Conservation Service Monitoring and Evaluation and the importance of the data to help quantify the changes to deep percolation, the Natural Resources Conservation Service has determined that having the evaluation results made public through a characterization and analysis of the results by the U.S. Geological Survey could be of use to a wider audience of water managers and the general public. In 2011, the U.S. Geological Survey, in cooperation with the Bureau of Reclamation and the Colorado River Basin Salinity Control Forum, began a study to evaluate the Natural Resources Conservation Service evaluation data to (1) document the methods of the evaluation, and (2) analyze and summarize the data collected during the evaluation. Mayo, J.W., 2015, Analysis of historic agricultural irrigation data from the Natural Resources Conservation Service monitoring and evaluation for Grand Valley, Lower Gunnison Basin, and McElmo Creek Basin, western Colorado, 1985 to 2003: U.S. Geological Survey Open-File Report 2014–1261, 176 p., https://dx.doi.org/10.3133/ofr20141261.